One task in my role as Digital Marketing Manager which I didn't realise would have quite such an emphasis is that of giving presentations. Looking back, I have given at least two 20min+ presentations a month on a variety of subjects - it's a good thing this is something I really enjoy! 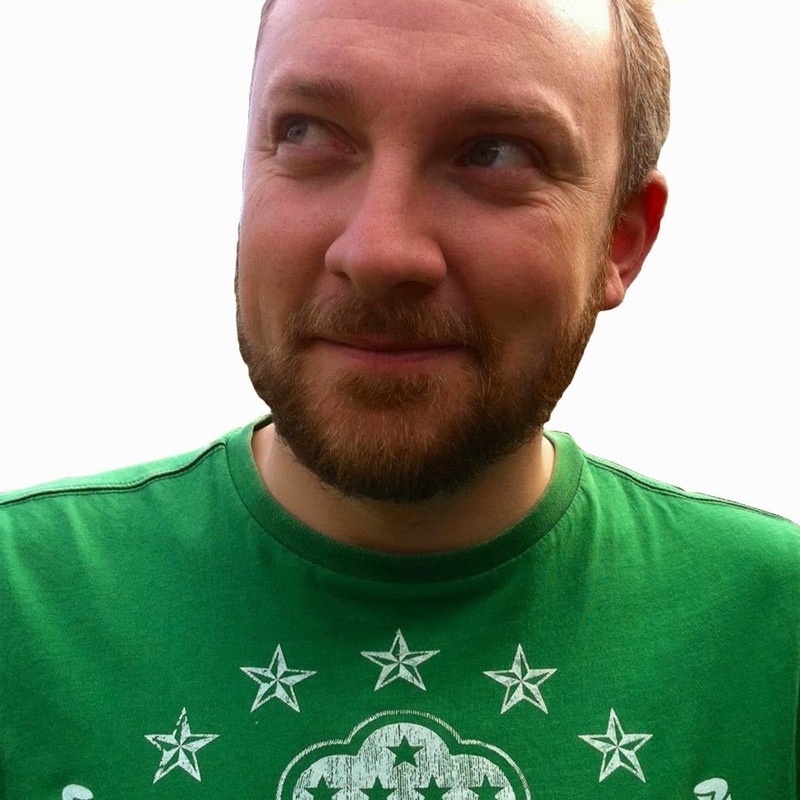 Perhaps it's because I'm some sort of natural showman but I think it's vital for me to get out there and promote the team's work with the hope of imparting some useful knowledge or triggering a brainstorming session. 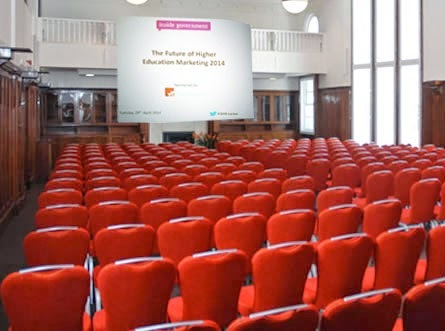 So it was then that Sarah Hampton (from our Marketing team) and myself were asked to present at the Inside Government Future of Higher Education Marketing 2014 conference. 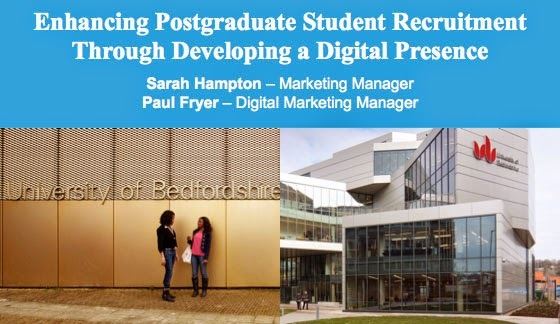 This was due to us being commended back in December for our website at the Prospects Postgraduate Awards and we've also recently seen an uplift of 30% in our Postgraduate student applications for September 2013. Our shift to digital techniques to achieve this was to be the main focus - it's a good thing that's in my job title! We set off to London earlier than usual on 29th April due to the fact there was to be a Tube strike. This would give us plenty of time to walk to the Hallam Conference Centre in Marylebone where we were due to present in the rather opulent Council Chamber (thankfully the weather was on our side!) We had the after lunch slot at 2.20pm so needed to make sure our energy levels were turned up to the maximum to keep the audience awake. The overwhelming feeling I got from the other presenters was that of some very talented and experienced marketers sharing what we need to focus on for the future in what is becoming a very competitive marketplace. Personally, the reason I like HE is that people are willing to share best practice, but this time it was clear people were happy to share what needs to be done but not necessarily how - I hope this is not a vision of our future. Where we differed slightly from the majority was that we had real examples and figures charting the success/failure of everything we did. Perhaps we were being too honest and a little naive?! 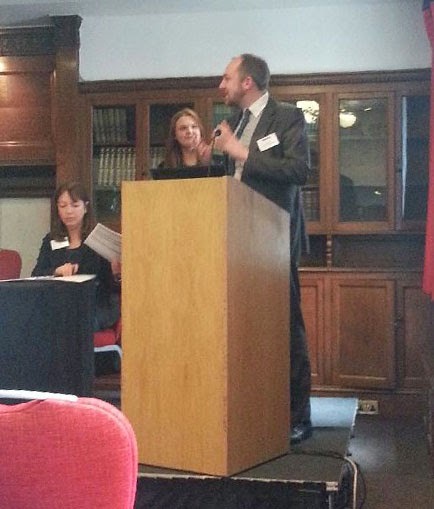 Jo, the conference organiser shared some feedback with us post event and this was overwhelmingly positive with one person saying it was 'a really engaging and insightful showcase of our work'. All in all, a good days work! Next up for me is an hour long presentation at our Clinical Education and Leadership away day this afternoon. We're then straight into the launch of our new iTrent jobs site for HR and I've been asked to contribute to the design and functionality of our forthcoming University app. Alongside all of this we're switching our website hosting package and are redesigning our news listings. Finally, is that the dreaded Clearing I see looming on the horizon? When's that next May bank holiday again...? !